Hairstylists use toners to counteract the underlying pigment left behind when lightening the hair. 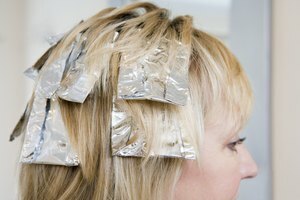 Toners are a semipermanent color typically used for blond highlights, although not limited to highlights or blond hair. Purchase toner at the beauty supply store or at the drugstore, and be sure to get a semipermanent color. Choose the lightest ash-based color to tone down any unwanted yellow or gold left in the hair. Tone highlights that are too cool with a gold-based tone. Again, be sure to choose one of the lightest colors. Deepen highlights that are too light with any semipermanent color. Choose a color with the underlying tone you want. Dry excess moisture from damp hair with a towel. Mix toner and developer in the color bottle. Follow the manufacturer's directions as to how much of each to use. Shake the bottle with your finger over the open tip. Mix the color well before you apply it. Apply toner starting at the scalp and working through the ends. Saturate the hair evenly to ensure all highlights are covered. Allow to process for 10 to 15 minutes. Pick a color that isn't too dark. Hair color can say "blond" on the bottle but appear light brown on your head. If you're buying at the beauty supply, you'll need to purchase the toner and developer separately, but you need both. If you're purchasing at the drugstore, all is included. Read the manufacturer's directions as to the ratio between color and developer. Most color lines will be 1 part color to 2 parts developer. The toner may not process into the color in the bottle, so don't worry if it doesn't look right while it's on your hair. If you remove it too soon, it may not have time to do its job.